According to a recent report published by Forbes, Europe’s top five football (soccer) leagues have deals in place that generate $8.2 billion per year in media rights. Without a doubt, England’s Premier League is the most lucrative, with Germany’s Bundesliga, Italy’s Serie A, and Spain’s La Liga in hot pursuit. Due to the high cost of licensing rights, TV broadcasters charge subscribers large sums to watch the action. 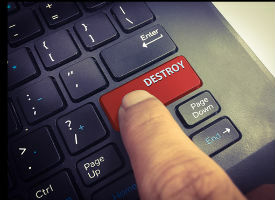 As a result, piracy of live matches is a growing industry, with regular websites streaming unauthorized content for free and premium IPTV providers charging relatively modest amounts for access to all of the major games. One of the most visible anti-piracy mechanisms is that operated by the Premier League. It has the backing of a High Court injunction in the UK which allows it to block streams in real-time. However, there are other techniques in place, ones that tippy-toe around the DMCA in an effort to restrict access to illegal suppliers. La Liga is the premier division of the Spanish football league. It has no fancy blocking authority but has been enjoying a level of success against unlicensed IPTV providers by sending somewhat questionable DMCA notices to Google. While most DMCA notices target specific content on a specific web page, those sent by La Liga try a much broader tactic. 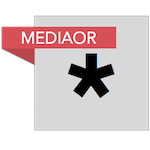 Instead of targeting the precise URLs from where their content is being broadcast (as the law requires), La Liga has been asking Google to remove ancillary administrative pages operated by IPTV providers. 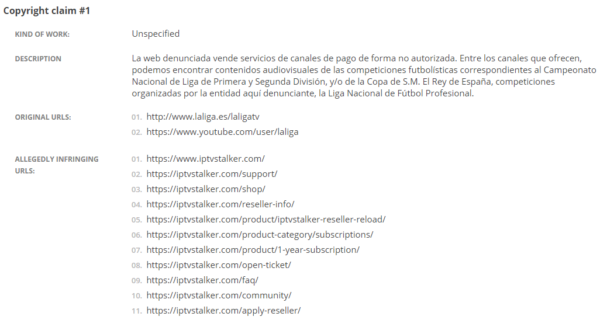 “The reported website sells payment channel services in an unauthorized manner,” La Liga begins. As the image above shows, La Liga isn’t claiming that any of its content is being made available on any of the above links. Indeed, after testing all of the URLs in the notice, it’s clear that none of them directly distribute any of La Liga’s content. Instead, each URL refers to various aspects of the IPTV seller’s business portal, from customer support to FAQs and its in-house community forum. Nevertheless, the strategy appears to work, with Google happily de-listing the provider’s URLs from its search results. Intrigued that Google deleted the IPTV provider’s pages (despite the actual infringing content not being anywhere present on the portal), we looked around to see if this effort by La Liga was a one-off. It wasn’t. Trawling the always-useful Lumen Database we can see that La Liga has filed a large number of notices in the same format targeting a number of providers including, but not limited to, BestBuyIPTV, IPTV-On, SnapIPTV, TelevisionIPTV, Sat-Gold, VadersTV, IPTVServerGate, and EpicIPTV. Of course, there are dozens – perhaps hundreds – of alternative suppliers but with Google appearing to play ball in many instances, it shouldn’t take long to make a decent sized dent in the availability of providers via Google search.